After I wrote yesterday's post, Jesse Walker called my attention to a 2006 blog post, by one Rufus Flypaper.
" ... many of the things that I enjoy in Robert Anton Wilson's novels- the endless array of characters and events, the silly surrealism, the corny names, and complex physics and philosophy thrown in- annoy me in Pynchon's novels. And I think maybe it's partially because Thomas Pynchon is supposed to be a great novelist, and Robt. Wilson is a "stand-up philosopher". I definitely don't think of Wilson as a great novelist; but then again, I don't think of Voltaire as a great playwright either. It's the fun of watching a deeply humane gadfly tossing out ideas that I enjoy. Maybe the reason that I like R.A.W. more is simply that I've never felt any pressure to take his books seriously in any way, while the massively overestimated Pynchon has always been presented to me as A Great Writer. "I don't think of Pynchon as a great writer any more than I do Wilson. But, there's something deeply childish about Pynchon's novels that irritates me. They seem to have been written by someone with very little interest in humanity. Robt. Wilson is deeply humane, and I just don't get that with Pynchon, even with his sympathetic characters. Of course, a novelist needn't be humane- many of the best aren't! But, a pile of fascinating minutiae should add up to something aside from a paranoid/autistic tangle. And I'm not convinced that it ever does in Pynchon." It seems to me what what Rufus put his finger on is that expectations play a large role in how we receive works on art; when I get around to reading Pynchon, it better be pretty darn good, or it won't live up to the hype. Similarly, I would guess that many of us have had the experience of seeing a heavily-panned movie and finding that it turned out to be pretty entertaining; it can be easier to enjoy something if your expectations originally were low. 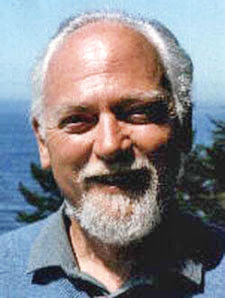 Robert Anton Wilson probably benefits from the fact that his readers are allowed to enjoy a sense of discovery. You're not discovering anyone if you read Pynchon or Don DeLillo. You're reading an author you've been told over and over again is a Great Author. Interesting post. I consider both Wilson and the Pynch great writers. I think Pynchon does care about humanity. I found many scenes in Against the Day particularly moving, and I found the ending of Mason and Dixon very moving. I hope you enjoy Mumbo Jumbo. I'm just starting to read Gravity's Rainbow, and it's not grabbing me as quickly as RAW's writing, but maybe there isn't enough of a Joycean influence on it. I do a lot of my "reading" in audiobook format these days, and I highly recommend listening to Inherent Vice, partly because I like the idea of a psychedelic detective story but mostly because the performance by Ron McLarty is so damn good.